Well, where to start, it has been a long and at times an unsettling week. I'll start at the beginning. I'm leaving out some of the more technical issues and trying to keep it simple. To start, Momma was admitted Monday Dec 19th to have a somewhat emergency c-section due to her ever growing issue with her high blood pressure. So we were sent to the hospital and told we would be having babies real soon. That was the easy part of the day. During the c-section, baby A (Harlan Jayne) was delivered at 3:28PM and was 5lbs 2oz and 18 1/2 inches. All was good with her, lots of crying just a little light in the weight department. 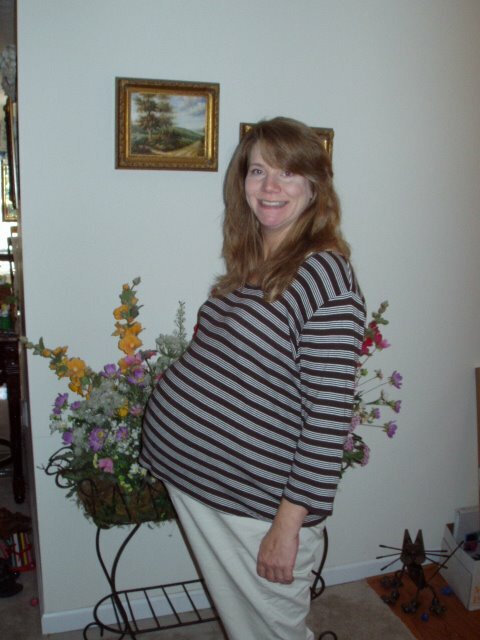 While Harlan was being delivered, baby B (Lanier Jeanne) decided she wanted to stay a while longer, so when her sister came out, she sent and to hide under her placenta, in the process of this also flipped and was breech, So while trying to find her, she ripped her sac and the doctor had to cut through the placenta to remove her. This caused massive volume loss in Lanier, which did not bode well for her. She was delivered at 3:31PM at 5lbs 2oz and 18 1/4 inches. Her weight is an issue because it was reported at 6lbs 7.5 oz. The last thing I cared about was how true her weight was and was glad that they were working on her. For Lanier, with the massive volume loss (bleeding out through the cord), she was rushed to the Special Care Nursery while her sister went to the newborn nursery. In SCN she had to have 2 blood transfusions as well as antibiotics, several lines for proteins, minerals, etc. Her APGAR scores were 1 at 1 minute, 7 at 5min, 8 at 10 minutes. The SCN staff worked on her for the better part of an hour, just to stabilize her. The worst feeling in the world is to look at your child, knowing you can do nothing and knowing that babies should not be white as a sheet, still and non-vocal. At 3 hours of life, she was looking like a real baby, at 12 HOL, she had recovered to the point that they had started taking the lines out, at 24 HOL, she was down to only nutrients and antibiotics, at around 24-36 HOL she developed a few cases of apnea, which resulted in caffeine being giving to her. Once the caffeine was in her system and after it was removed, she has not had any repeat episodes to date. Well each day for Lanier was a great improvement and the SCN staff were amazed at how she had improved since her birth. Well on Friday Harlan was allowed to come home, in our case the hospital guest house with me and Momma. We had to stay close to be able to feed Lanier. Each day for Lanier was better than the day before, By Christmas Eve and early Christmas day she was totally off any supplements or other lines that she was on. She was totally on either Momma's milk and formula. She was doing so good that she was discharged from SCN on Christmas day. So here we are , me a house full of women, they are doing good so far, both a bit under weight, but we have them on a higher calorie formula that the pediatrician suggested. Lanier is on an apnea machine for 4 months, and will be going to therapy at 3,6,9 and 12 months. This therapy session is to check that she is developing normally based on the way she came into this world. Well the first to the specialist on Thursday was an adventure even before we got to the Doctors Office. We had a minor ice storm Wednesday night, well it wasn't bad until we got up Thursday morning. The power was on and off and by the time we realized, hey the garage door is electric, the power was out for good. We had already planned on leaving a little early, but now with the power out, we decided we better move the time up some more. So we had to pop the "if stuck" cord on the garage, move the car, manually put the garage door back and re-attach the cord. From there we thought we would take the long way, or the way that was well traveled. But after leaving the neighborhood, we decided on our second or medium way. Well we had to look out for some falling ice a a few downed branches, nothing major. Well this ended up putting us at the doctor's office almost 45 minutes early, oh well. Well we got to see the specialist today, that included the normal weight checks (5 lb 3 oz and 5 lb 1 oz). So the babies size is going good. We did blood flow checks, body checks, heart checks and it all looked good. We even were able to see head hair on one of the babies. We got a picture, put it looks more fuzzy than anything. The doctor said everything was looking good and that the preeclamcia has not gotten any worse and that we should continue to monitor her BP every few hours. We have follow-up appointments next well on Monday and then on Thursday. The Thursday appt is with the Specialist again. Well the bed rest is well not so restful according to Dana. She is getting to the point where you can only sleep so much. One of the things with this bed rest is you tend to sleep and good deal, except when its time to sleep. Well the babies are still moving quite well. Dana gets such enjoyment out of watching the "little aliens" move under the skin. For those that remember the Alien movies, then you know what I'm talking about. Well the visit to the OB went OK. Her BP is still a bit high, but her protein levels are staying about the same. Babies were still responding well. With that they sent us back home and scheduled us for an appointment with the Specialist on Thursday. We still have to monitor her BP every few hours. IF either number reaches a set thresold, then we will have to notifiy the OB and they may admit her until its time to deliver. As far as bed rest goes, Dana is still not thrilled with the idea, but understands. I still have to get on her to stop trying to do things. But at most we have 6 weeks left, but I'm sticking to my prediction that they will be the week after Christmas. Well this post is a little late in coming but have been a bit busy. Well think of Gilligan and his 7 hour tour, but ours was only to be 2 hours. We had our normal OB visit on the 7th, (at 33 1/2 weeks) Things were going good, but a few of the test came back a little high. Also with that the specialist had noted that he was beginning to worry with preeclampsia, so the OB sent us down to the Labor and Delivery unit at the hospital to do some blood work and some baby stress tests. Which was only to be a few hours, enough time to get the reading for the babies and the blood work back. So, the saga begins, first the babies looked good, all was good, but momma's tests came back with some issues. Her potassium and magnesium were low and her BP was higher that they would like. And with the swelling they wanted to do some more tests and get her levels back to a more normal state. So now we are in for 24 hours. IVs, pills, BP checks, baby checks, some of these every few hours. Plus we had the steroid shots to help the babies' lungs develop, just in case they had to deliver them early. Well momma's levels didn't go up as high as they would like so now we have another 24 hours, this time with a 24 hour protein check. Apparently the magic number is 1000 for our OBs. 500 is a no worry, 1000 they said they start to get a bit concerned. Ours was 1080. Well during this 24 hours we saw all 3 of the OBs in the practice, we saw our specialist. After all the tests from this second day came back and the docs conferred, they allowed us to return home. During this time, momma is on total best rest, we have to check BP every few hours, plus some potassium supplements. So we go back to the OB on Monday and the specialist either Thursday or Friday. Well the second appoint is assuming we don't get re-admitted. If we get re-admitted, I think we are there until the twins are delivered. well we now have to go in once a week. Her blood pressure was a little high and with the swelling of the feet she has, plus the 25% of women that have issues that happen to have multiples, age, etc, they are starting to watch for preeclampsia. But over all the doc said the babies were doing good, one is 4lbs 6oz the other 4 lbs, 5 oz. The key is they stay within the same body weights. If not that means something is wrong with one of several things. 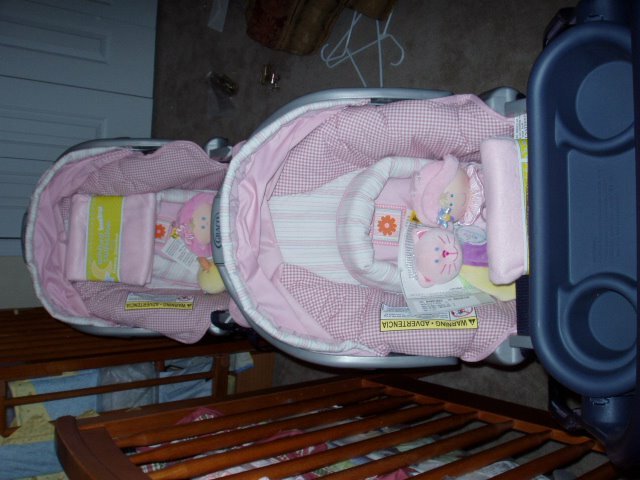 But in our case since they have 2 sacs, 2 cords (or one a piece) the doc says we have the best scenario for twins. Well thanksgiving was also the day for the family baby shower with her folks and sisters and the rest. 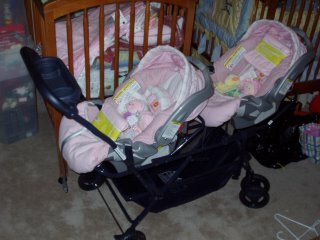 We got a bunch of baby clothes, 2 car seats, and snap n' go stroller and some blankets. The best was the 2 car seat holder stroller. Well Just got back from the OB and things are still looking good. 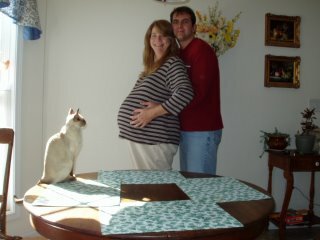 We are at or around 29-30 weeks and have another Appt right after thanksgiving. The next appt is with the specialist and will give us approx size and weight. At last check, 3-4 weeks ago, both were around 1lb 14 oz which was right on scale for the time into the pregnancy. The OB says that this is the time 30 weeks, that we (she) would really be able to tell she is carrying twins. And we have noticed that she is starting to have the swollen feet but nothing big. We have also found that she is getting larger, it seems almost everyday. Well just got back from the OB, everything is still looking good. So We are at 28/29 Weeks so not long now. We are still thinking around the 36 week mark (normal for twins). We got a good scan of the twins heads that I hope to post later today. Well I attended the Daddy's meeting last night. This is one of those classes that tell you what to expect and some basic how-to's. It dealt mainly with some of the fears and concepts that may be seen before, buring and after birth. Most I knew about, some I did not. Over all it was worth the time to have it. Although I believe that most the the guys in the class attended only to a) get out of the house or b) forced to go. One guy came, signed in, got the hand outs and left. Another said he had to take this time for the class because all the other interferred with his coaching. He's a winner. :). But over all it was a good experience and I got to meet the head on the NNICU for the hospital where we will be having the twins. Well we had our first of several baby classes today. We opted for the all in 2 days over the once a week for five weeks. We did get to take a tour of the hostpital and met some folks from around the area. And we were the only ones having twins and the only ones that know we will be having a c-section. With those conditions, the RN teaching the class geared a lot towards the other folks in the class, but did make a special point for us. We did get to see the NICU which was nice. Although we hope we don't have to see it again. Well had the begining of our bi-monthly ob checkups. All was good with momma and the twins. Although momma did chip a tooth, so we have been figuring out what the SOP is for somehting like that. Looks like a normal thing with no worries. Fingers crossed. well here are some scans from early july. Well we are getting close to our next appointment later this week. MOmmy thinks she is not getting any bigger, but I can tell. Well, since I got a late start on this, I thought I would give a quick summary of where we are. As for the history of the twins (I know I shouldn't refer to them as "The Twins", but until we release the names thats what they will be known as), it all started in January of 2005. We were trying for a baby and got one, but later learned that we would lose it. We were told to wait a few months before we tried again. Then came April 2005, we weren't really trying, but ended up hitting the jackpot with twins. I can remember when Dana came home and told me. She had gone for a normal visit, just to see if she was infact pregnant. I was coming down the hall and she goes, well we're pregnant and I heard their heartbeats. I stopped, jaw hit the floor, and I was like "their heartbeats." Thats how we got going. Since then we have had our fair share of doctor visits, ultrasounds, a few 3-d images. Over this time we have been to a many a baby show, sales, etc to begin gathering up all the supplies needed. 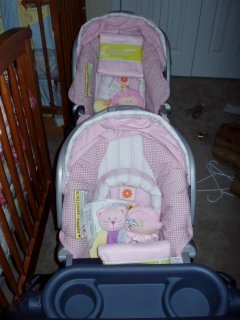 One thing we did find out is the number of discounts we get because we have twins. Lots of buy one get one discounts, extra formula and so on. We have had only one scare so far and that was more than enough for all 4 of us. We went to the doctor and they gave us the all clear. As far as telling folks, we have told most family members and some friends. But I, have been holding off on telling the rest of the family and co-workers until closer to the time. At some point I will get around to posting some of the ultrasounds so that all can share in the excitement. Well thats the nuts and bolts for now.